This is the tenth installment in a series examining the activities and individuals behind the Bilderberg Group. Read the first, second, third, fourth, fifth, sixth, seventh, eighth and ninth parts in the series. I previously examined the functions of the Bilderberg meetings; the composition and concentration of financial markets and the Mafiocracy that rules them; the nature of technocracy, and the role of finance ministers, central banks and the IMF in managing the European debt crisis. This installment takes a closer look at the top technocrats of the European Council and the European Commission. The “Troika” of the European Central Bank (ECB), International Monetary Fund (IMF) and European Commission (EC) was largely tasked with managing the response to the debt crisis, organizing bailouts, imposing austerity and saving the banks at the expense of the populations of Europe. The Troika reported to the Eurogroup of 17 finance ministers who represented all of the countries that used the euro as their single common currency. The European Union project evolved and expanded over decades since the end of World War II, and always with an elite-driven, technocratic structure. As the E.U. moves through the debt crisis, its solutions and actions invariably delegate more authority to both existing and new technocratic institutions that wield immense power over nation-states within the E.U. Sovereignty is increasingly transferred from the nation and its democratically elected leaders to the supra-national technocratic structure of the E.U., and the top bureaucrats and technicians who run it. The European Council and the European Commission are the major centers of power within the E.U.’s political structure. The European Central Bank is equally if not more powerful, but it doesn’t answer to any political authority since it’s considered to be “independent” (aka exclusively in the service of private interests). The European Council groups together the heads of state (presidents and prime ministers) of all E.U. nations, comprising the supreme governing authority of the E.U. The Council is presided over by a permanent president. Over the course of the European debt crisis, that president was Herman Van Rompuy. As European leaders were attempting to negotiate and horse-trade to fill key appointments in the EU apparatus in late 2009, Van Rompuy was considered a “dark horse” to occupy the first-ever permanent president of the European Council. Van Rompuy was relatively unknown outside Belgium and had only been the country’s Prime Minister for 11 months when he got the top job in the E.U. Roughly a week before European leaders announced him as their selection, Van Rompuy attended a private dinner with members of the Bilderberg steering committee on Nov. 12, 2009. Van Rompuy was invited to the dinner by then-chairman of the Bilderberg meetings, Etienne Davignon, a former top E.U. technocrat, in order “to promote his candidacy” for the top job. At the dinner, which was attended by top industrialists, financiers and even war criminals like Henry Kissinger, Van Rompuy was able to impress the group with a speech and engage in “off-the-record” talks with the unelected oligarchs. At the dinner meeting, Van Rompuy reportedly raised the issue of E.U. financing, suggesting that a continental E.U. tax could even be envisioned. Seven days later, Van Rompuy was announced as the final choice for president of the European Council. According to The New York Times, Van Rompuy’s selection was seen as the “result of backroom negotiations among [E.U.] leaders jockeying for future and more important economic portfolios that could be more powerful in the enlarged European Union” – in some ways a similar method as how the Chinese choose who sits in the top political positions of authority within the Communist Party and State. Together with the President of the European Commission, the ECB and the Eurogroup of finance ministers, Van Rompuy indeed played an important role in the management of Europe’s debt crisis. After attending the Bilderberg steering committee meeting in 2009, just prior to getting Europe’s top job, he later attended a Bilderberg meeting in 2011 while sitting as president of the European Council. José Manuel Barroso finished his second term as President of the European Commission in late 2014, after serving in that post for the previous ten years. Prior to that, he served as prime minister of Portugal from 2002 to 2004. Barroso has attended numerous Bilderberg meetings: in 1994, 2003, 2005 and 2013. On top of that, Barroso has attended meetings of the Trilateral Commission, including the one that took place in Portugal in 2003 while Barroso was prime minister. He also attended the Commission’s annual meeting in 2007 that took place in Brussels while he was the European Commission president. Barroso explained his understanding of the global economy to his esteemed audience, noting that the rapid growth in “emerging markets” was increasing global wealth, but also increasing competition for that wealth with countries like China and India able to better exploit cheap labor while the U.S. with its high-tech boom was leaving Europe behind. “The status quo is no longer an option for the E.U.,” Barroso continued. The E.U. must change “in order for Europe to fully reap the benefits of ongoing globalization,” and the continent had to “increase the flexibility of markets” and strengthen its “productivity.” Translation: deregulate all markets, dismantle labor rights and protections, reduce living standards so as to create a cheaper labor force capable of competing with Asia, and increase finance for research and development to spur high-tech growth. Among the major “priorities” were making workers “more adaptable and labour markets more flexible.” No doubt, Barroso’s audience of bankers and financiers agreed with him. It should be noted that the top leadership of the IIF are frequently Bilderberg members and participants, and that other speakers invited to the IIF’s Spring meeting included “senior government officials from Brazil, Chile, China, Slovakia, Spain and the U.K.,” as well as “leading international economists,” the managing director of the IMF, and the former president of Mexico. The next and final installment in the series examines Barroso’s continued role, and the role of the European Commission, from 2009 onwards. This is the ninth installment in a series examining the activities and individuals behind the Bilderberg Group. Read the first, second, third, fourth, fifth, sixth, seventh and eighth parts in the series. In previous installments, this series has examined the historical role played by Bilderberg meetings in influencing major institutions and policies across North America and Western Europe over the past half century; the role of the meetings in supporting the rise of corporate and financial-friendly politicians to high office; the representation of interests from among the global financial elite, and the promotion of technocracy (particularly in Europe) and the representation of key technocratic institutions and individuals from Europe’s finance ministries and central banks, who’ve played important roles in the management of Europe’s financial and debt crises between 2008 and 2014. This installment continues with an examination of Bilderberg’s role in facilitating the advancement of transnational technocracy in the EU, bringing in some of the top technocrats from leading European and international organizations to meet in secret with finance ministers, central bankers, politicians, corporate executives, bankers and financiers. The role of finance ministers and central banks has been the focus of the previous two installments in this series. Now we look at the IMF, which, together with the European Central Bank (ECB) and the European Commission (EC), functioned as the “Troika” tasked with managing the international response to the debt crisis, organizing the bailouts and imposing harsh austerity measures and structural reforms upon the nations and people of Europe. The IMF is designed to come to the “aid” of countries experiencing financial and monetary crises, to provide loans in return for the nations implementing austerity measures and key structural reforms, and to promote easy access for foreign investors (ie. banks and corporations) to buy up large portions of the local economy, enriching both domestic and foreign elites in the process. Thus, a nation which gets a loan from the IMF must typically dismantle its social services, fire public sector workers, increase taxes, reduce benefits, cut education and health care, privatize state-owned assets and industries, devalue its currency, and dismantle labor protections and regulations, all of which plunges the population into poverty and allows for major global banks and corporations to seize the levers of the domestic economy and exploit the impoverished population as cheap labor. As the major Western commercial banks lent out vast sums of money to developing nations during the 1970s, they created immense liabilities (ie. risks) for themselves. As interest rates on debt began to rise, thanks to the actions of the Federal Reserve, heavily-indebted countries could no longer pay the interest on their loans to banks. As a result, they were thrust into financial and debt crises, in need of loans to pay down their debts and finance government spending. A key problem emerged, however, in that major commercial banks (who stopped funding developing nations) could not force them to implement the desired policies. What was needed was a united front of major banks, powerful industrial nations and international organizations. Enter the IMF: controlled by the finance ministries of the majority of the world’s nations, with the U.S. Treasury holding veto power over all major decisions. The IMF was able to represent a globally united front on behalf of the interests of commercial banks. All funding from governments, international organizations and banks would be cut off to developing nations in crisis unless they implemented the policies and “reforms” demanded by the IMF. Once they signed a loan agreement and agreed to its conditions, the IMF would release funds, and other nations, institutions and banks would get the green light to continue funding as well. The IMF’s loans, policy prescriptions and reforms that it imposes on other nations have the effect of ultimately bailing out Western banks. Countries are forced to impoverish their populations and open up their economies to foreign exploitation so that they can receive a loan from the IMF, which then allows the indebted nation to simply pay the interest on its debt to Western banks. As a result, the IMF loan adds to the overall national debt (which will have to be repaid down the line), and because the nation is in crisis, all of its new loans come with higher interest rates (since the country is deemed a high risk). This has the effect of expanding a country’s overall debt and ensuring future financial and debt crises, forcing the country to continue in the death-spiral of seeking more loans (and imposing more austerity and reforms) to pay off the interest on larger debts. As a result, entire nations and regions are plunged into poverty and abusive forms of exploitation, with their political and economic systems largely controlled by international technocrats at the IMF and World Bank, mostly for the benefit of Western commercial banks and transnational corporations. The IMF has amassed great power over the past few decades, and because its conditions and demands on nations primarily revolve around imposing austerity measures and “balancing budgets,” the IMF has earned the nickname “It’s Mostly Fiscal”. However, due to the effects of the fiscal policies demanded and imposed by the IMF, causing widespread poverty, increasing hunger, infant mortality, disease and inequality, many populations and leaders of indebted nations view the IMF as far more than “fiscal.” In fact, former Egyptian dictator Hosni Mubarak once referred to the IMF as the “International Misery Fund,” a sentiment shared by many protesters in poor nations experiencing the effects of harsh austerity measures. As one of the world’s most important and influential technocratic institutions, the IMF has a keen interest in the goings-on behind closed doors at annual Bilderberg meetings, just as the group’s participants have a keen interest in the leadership and policies of the IMF. In fact, it is largely an unofficial tradition that the managing director of the IMF is frequently chosen from among Bilderberg participants, or in the very least, attends the meetings following their appointment. In a 2011 article about that year’s Bilderberg meeting, I commented on the race to find a new managing director of the IMF, noting that only Christine Lagarde, the French finance minister, had previously attended a Bilderberg meeting (in 2009), and therefore, she seemed a likely choice. Shortly after Lagarde officially began to campaign to become the head of the IMF, the German, British and Italian finance ministries endorsed her candidacy, with the main rival for the top spot being the governor of the central bank of Mexico, Agustin Carstens, who secured the backing of the Latin American nations as well as Canada and Australia. Lagarde then received the golden seal of approval when she was endorsed by the U.S. Treasury Department, the only veto power voter at the IMF. Then-Treasury Secretary Timothy Geithner commented that Lagarde would “provide invaluable leadership for this indispensible institution at a critical time.” While she was campaigning, Lagarde also managed to secure the backing of China, after she met for lunch with the Chinese central bank governor and deputy prime minister. The actions of these institutions were so damaging to the economies and societies – and social stability – of many European countries that a formal investigation into the activities of the Troika was held in the European Parliament in late 2013 and early 2014. The final report, produced by Members of the European Parliament (MEPs), concluded that the Troika’s structure and accountability resulted “in a lack of appropriate scrutiny and democratic accountability as a whole.” After all, the growth and empowerment of technocracy coincides with the undermining and decline of democracy. Christine Lagarde, who has spent her career as a corporate lawyer and finance minister, has steered the IMF on its consistent path of functioning as a transnational technocratic institution concerned primarily with serving the interests of global financial markets. As such, her participation in Bilderberg meetings – in 2009, 2013 and 2014 – brings her into direct contact with her real constituency: the ruling oligarchy. This article and its accompanying infographic have been jointly published by the Transnational Institute and Occupy.com. The annual meetings of the World Economic Forum (WEF) in Davos, Switzerland, bring together thousands of the world’s top corporate executives, bankers and financiers with leading heads of state, finance and trade ministers, central bankers and policymakers from dozens of the world’s largest economies; the heads of all major international organizations including the IMF, World Bank, World Trade Organization, Bank for International Settlements, UN, OECD and others, as well as hundreds of academics, economists, political scientists, journalists, cultural elites and occasional celebrities. The WEF states that it is “committed to improving the state of the world through public-private cooperation,” collaborating with corporate, political, academic and other influential groups and sectors “to shape global, regional and industry agendas” and to “define challenges, solutions and actions.” Apart from the annual forum meeting in Davos, the WEF hosts regional and sometimes even country-specific meetings multiple times a year in Asia, Latin America, Africa and elsewhere. The Forum is host to dozens of different projects bringing together academics with corporate representatives and policy-makers to promote particular issues and positions on a wide array of subjects, from investment to the environment, employment, technology and inequality. From these projects and others, the Forum publishes dozens of reports annually, identifying key issues of importance, risks, opportunities, investments and reforms. The WEF has survived by adapting to the times. Following the surge of so-called anti-globalization protests in 1999, the Forum began to invite non-governmental organizations representing constituencies that were more frequently found in the streets protesting against meetings of the WTO, IMF and Group of Seven. In the 2000 meeting at Davos, the Forum invited leaders from 15 NGOs to debate the heads of the WTO and the President of Mexico on the subject of globalization. The participation of NGOs and non-profit organizations has increased over time, and not without reason. According to a poll conducted on behalf of the WEF just prior to the 2011 meeting, while global trust in bankers, governments and business was significantly low, NGOs had the highest rate of trust among the public. So, what exactly has the World Economic Forum been doing, and how did it emerge in the first place? It began in 1971 as the European Management Forum, inviting roughly 400 of Europe’s top CEOs to promote American forms of business management. Created by Schwab, a Swiss national who studied in the U.S. and who still heads the event today, the Forum changed its name in 1987 to the World Economic Forum after growing into an annual get together of global elites who promoted and profited off of the expansion of “global markets.” It is the gathering place for the titans of corporate and financial power. Despite the globalizing economy, politics at the Forum have remained surprisingly national. The annual meetings are a means to promote social connections between key global power players and national leaders along with the plutocratic class of corporate and financial oligarchs. 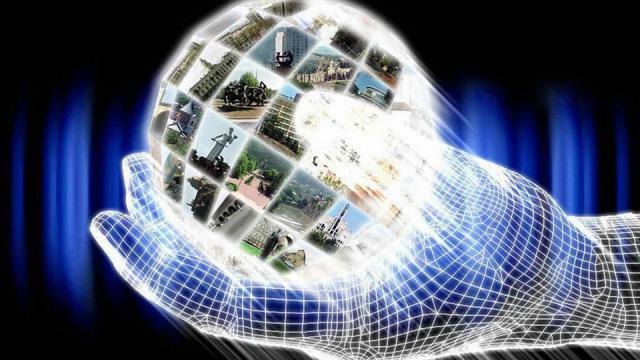 The WEF has been a consistent forum for advanced “networking” and deal-making between companies, occasional geopolitical announcements and agreements, and for the promotion of “global governance” in a world governed of global markets. Writing in the Financial Times, Gideon Rachman noted that more than anything else, “the true significance of the World Economic Forum lies in the realm of ideas and ideology,” noting that it was where the world’s leaders gathered “to set aside their differences and to speak a common language… they restate their commitment to a single, global economy and to the capitalist values that underpin it.” This reflected the “globalization consensus” which was embraced not simply by the powerful Group of Seven nations, but by many of the prominent emerging markets such as China, Russia, India and Brazil. Indeed, the World Economic Forum’s main purpose is to function as a socializing institution for the emerging global elite, globalization’s “Mafiocracy” of bankers, industrialists, oligarchs, technocrats and politicians. They promote common ideas, and serve common interests: their own. The World Economic Forum has been shaped by – and has in turn, shaped – the course and changes in geopolitics, or “world order,” over the past several decades. Created amidst the rise of West Germany and Japan as prominent economic powers competing with the United States, the oil shocks of the 1970s also produced immense new powers for the Arab oil dictatorships and the large global banks that recycled that oil money, loaning it to Third World countries. New forums for “global governance” began to emerge, such as the meetings of the Group of Seven: the heads of state, finance ministers and central bank governors of the seven leading industrial powers including the U.S., West Germany, Japan, U.K., France, Italy and Canada, starting in 1975. 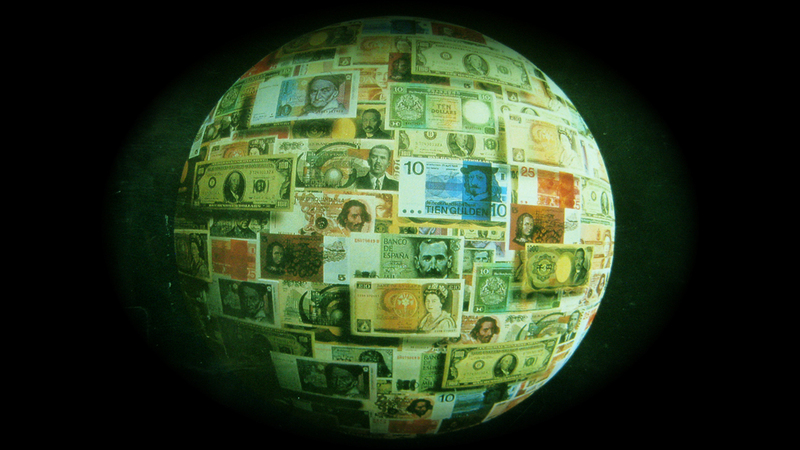 When the debt crisis of the 1980s hit, the International Monetary Fund and the World Bank achieved immense new powers over entire economies and regions, reshaping the structure of societies to promote “market economies” and advance the interests of domestic and international corporate and financial oligarchs. Between 1989 and 1991, the global power structure changed dramatically with the fall of the Berlin Wall and the collapse of the Soviet Union. With that came President George H.W. Bush’s announcement of a “New World Order” in which America claimed “victory” in the Cold War, and a unipolar world took shape under the hegemony of the United States. The ideological war between the West and the Soviet Union was declared victorious in favor of Western Capitalist Democracy. The “market system” was to become globalized as never before, especially under the presidency of Bill Clinton who led the U.S. during its largest ever economic expansion between 1993 and 2001. During this time, the annual meetings of the World Economic Forum became more important than ever, and the role of the WEF in establishing a “Davos Class” became widely acknowledged. At the 1990 meeting, the focus was on Eastern Europe and the Soviet Union’s transition to “market-oriented economies.” Political leaders from Eastern Europe and Western Europe met in private meetings, with West German Chancellor Helmut Kohl articulating his desire to reunify Germany and cement Germany’s growing power within the European Community and NATO. Helmut Kohl laid out his strategy for shaping the “security and economic structure of Europe” within a unified Germany. Kohl’s “grand design” for Europe envisioned a unified Germany as being “firmly anchored” in the expanding European Community, the main objective of which was to establish an “internal market” by 1992 and to advance toward an economic and monetary union, with potential to expand eastward. Kohl presented this as a peaceful way for German power to grow while assuaging fears of Eastern Europeans and others about the economically resurgent country at the heart of Europe. At the 1992 WEF meeting, the United States and reunified Germany encouraged “drastic steps to insure a liberalization of world trade,” and furthered efforts to support the growth of market economies in Eastern Europe. The German Economics Minister called for the Group of Seven to meet and restart global trade talks through the 105-nation General Agreement on Tariffs and Trade (GATT). At that same meeting, the Chinese delegation included Prime Minister Li Peng, who was the highest-level Chinese official to travel internationally since the 1989 Tiananmen Square crackdown. Later that year, Anthony Lake, Bill Clinton’s National Security Adviser, articulated the “Clinton Doctrine” for the world, explaining: “The successor to a doctrine of containment must be a strategy of enlargement – enlargement of the world’s free community of market democracies.” Lake explained that the United States “must combine our broad goals of fostering democracy and markets with our more traditional geostrategic interests.” No doubt, the Davos crowd welcomed such news. 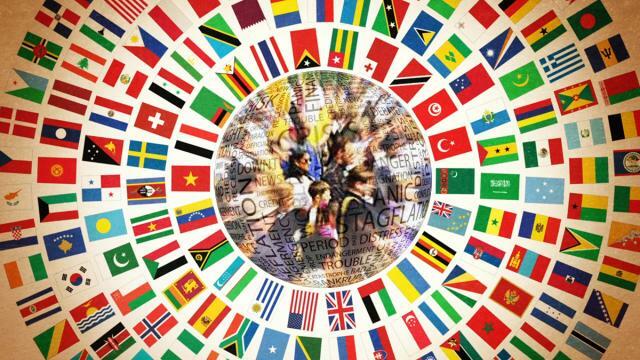 At the 1994 meeting, the director-general of GATT, Peter D. Sutherland, declared that world leaders needed to establish “a new high-level forum for international economic co-operation,” moving beyond the Group of Seven to become more inclusive of the major “emerging market” economies. Sutherland told the assembled plutocrats that “we cannot continue with the majority of the world’s people excluded from participation in global economic management.” Eventually, the organization Sutherland described was formed, as the Group of 20, bringing the leading 20 industrial and economic powers together in one setting. Formed in 1999, the G20 didn’t become a major forum for global governance until the 2008 financial crisis. In 1995, the Financial Times noted that the new “buzzword” for international policymakers was “global governance,” articulating a desire and strategy for updating and expanding the institutions and efforts of international co-operation. The January 1995 World Economic Forum meeting was the venue for the presentation of an official UN report on global governance. President Clinton addressed the Davos crowd by satellite, stressing that he would continue to push for the construction of a new “economic architecture,” notably at meetings of the Group of Seven. In fact, at the previous year’s meeting in Davos, the World Economic Forum functioned precisely as the vanguard for seven Russian oligarchs to take control of Russia and shape its future. At the 1996 meeting of the WEF, the Russian delegation was made up largely of the country’s new oligarchs who had amassed great fortunes in the transition to a market economy. Their great worry was that Russian President Boris Yeltsin would lose his re-election later that year to the resurgence of the Communists. At the WEF meeting, seven Russian oligarchs, led by Boris Berezovsky, formed an alliance during private meetings, where they decided to fund Yeltsin’s re-election and work together to “reshape their country’s future.” This alliance (or cartel, as some may refer to it), was the key to Yeltsin’s re-election victory later that year, as they held weekly meetings with Yeltsin’s chief of staff, Anatoly Chubais, the architect of Russia’s privatization program that made them all so rich. Berezovsky explained that if the oligarchs did not work together to promote common ends, it would be impossible to have a transition to a market economy “automatically.” Instead, he explained, “We need to use all our power to realize this transformation.” As the Financial Times noted, the oligarchs “assembled a remarkable political machine to entrench and promote the market economy – as well as their own financial interests,” as the seven men collectively controlled roughly half the entire Russian economy. In 2010, China’s presence at Davos was a significant one. Prime Minister Wen Jiabao, who attended the previous year, was not to return. In his stead, his chosen successor, Li Keqiang, attended. China’s economy was performing better than expected as its government was coming under increases pressure from major global corporations. Kristin Forbes, a former member of the White House Council of Economic Advisers and an attendee at Davos, commented, “China is the West’s greatest hope and greatest fear… No one was quite ready for how fast China has emerged… Now everyone is trying to understand what sort of China they will be dealing with.” China sent its largest delegation to date to the World Economic Forum, with a total of 54 executives and government officials, many of whom were intending to “go shopping” for clients among the world’s elite. In 2011, The New York Times declared that the World Economic Forum represented “the emergence of an international economic elite” that took place at the same time as unprecedented increases in inequality between the rich and poor, particularly in the powerful countries but also in the fast-emerging economies. Chrystia Freeland wrote that “the rise of government-connected plutocrats is not just a phenomenon in places like Russia, India and China,” but that the major Western bailouts reflected what the former chief economist at the IMF, Simon Johnson, referred to as a “quiet coup” by bankers in the United States and elsewhere. The power of global finance – and in particular, banks and oligarchs – has grown with each successive financial crisis. As the financial crisis tore through the world in 2008, the January 2009 meeting of the World Economic Forum featured less of the Wall Street titans and more top politicians. Schwab declared, “The pendulum has swung and power has moved back to governments,” adding that “this is the biggest economic crisis since Davos began.” Goldman Sachs, which in past years was “renowned for hosting one of the hottest parties at the World Economic Forum’s glittering annual meeting in Davos,” had cancelled its 2009 party. Nonetheless, Jamie Dimon, CEO of JPMorgan Chase, decided to continue with his plans to host a Davos party. In 2010, thousands of delegates assembled to discuss the “important’ issues of the day. And despite the reputation of banks and bankers being at all-time lows, top executives of the world’s largest financial institutions showed up in full force. The week before the meeting, President Obama called for the establishment of laws to deal with the “too big to fail” banks, and European leaders were responding to the anger of their domestic populations for having to pay for the massive bailouts of financial institutions during the financial crisis. Britain and France were discussing the prospect of taxing banker bonuses, and Mervyn King, governor of the Bank of England, suggested the possibility of breaking up the big banks. Several panels at the WEF meeting were devoted to discussing the financial system and its possible regulation, as bankers like Josef Ackermann of Deutsche Bank suggested that they would agree to limited regulations (at least on “capital requirements”). As the 2011 Davos meeting began, Edelman, a major communications consultancy, released a report that revealed a poll conducted among 5,000 wealthy and educated individuals in 23 countries, considered to be “well-informed.” The results of the poll showed there to be a massive decline in trust for major institutions, with banks taking the biggest hit. Prior to the financial crisis in 2007, 71% of those polled expressed trust in banks compared with a new low of 25 percent in 2011. Despite the lack of public trust in banks and financial institutions, Davos remains devoted to protecting and expanding the interests of the financial elite. In fact, the Foundation Board of the World Economic Forum (its top governing body) includes many representatives of the world of finance and global financial governance. Among them are Mukesh Ambani, who sits on advisory boards to Citigroup, Bank of America and the National Bank of Kuwait; and Herman Gref, the CEO of Sberbank, a large Russian bank. Ernesto Zedillo, the former President of Mexico who is also a member of the board, currently serves as a director on the boards of Rolls Royce and JPMorgan Chase, international advisory boards to BP and Credit Suisse, an adviser to the Bill & Melinda Gates Foundation, and is a member of the Group of Thirty and the Trilateral Commission as well as sitting on the board of one of the world’s most influential economic think tanks, the Peterson Institute for International Economics. Also notable, Mark Carney, the governor of the Bank of England, is a member of the Foundation Board of the World Economic Forum. Carney started his career working for Goldman Sachs for 13 years, after which he was appointed as Deputy Governor of the Bank of Canada. After a subsequent stint in Canada’s Ministry of Finance, Carney returned to the Bank of Canada as governor from 2008 to 2013, when he became the first non-Briton to be appointed as head of the Bank of England in its 330-year history. From 2011 to present, Carney has also been the Chairman of the Financial Stability Board, run out of the Bank for International Settlements in Basel, Switzerland. Apart from heading the FSB, Mark Carney is also a board member of the BIS, which serves as the central bank for the world’s major central banks. He is also a member of the Group of Thirty, a private and highly influential think tank and lobby group that brings together dozens of the most influential economists, central bankers, commercial bankers and finance ministers. Carney has also been a regular attendee at annual meetings of the Bilderberg Group, an even more-exclusive “invite only” global conference than the WEF. Though there are few women among the WEF’s membership – let alone its leadership – Christine Lagarde has made the list, while simultaneously serving as the managing director of the IMF. She previously served as the French finance minister throughout the course of the financial crisis. Lagarde also attends occasional Bilderberg meetings, and is one of the most powerful technocrats in the world. Min Zhu, the deputy managing director of the IMF, also sits on the WEF’s board. The membership of the WEF is divided into three categories: Regional Partners, Industry Partner Groups, and the most esteemed, the Strategic Partners. Membership fees paid by corporations and industry groups finance the Forum and its activities and provide the member company with extra access to meet delegates, hold private meetings and set the agenda. In 2015, the cost of an annual Strategic Partner status with the WEF had increased to nearly $700,000. Among the WEF’s current strategic partners are Bank of America, Barclays, BlackRock, BP, Chevron, Citi, Coca-Cola, Credit Suisse, Deutsche Bank, Dow Chemical, Facebook, GE, Goldman Sachs, Google, HSBC, JPMorgan Chase, Morgan Stanley, PepsiCo, Siemens, Total, and UBS, among others. 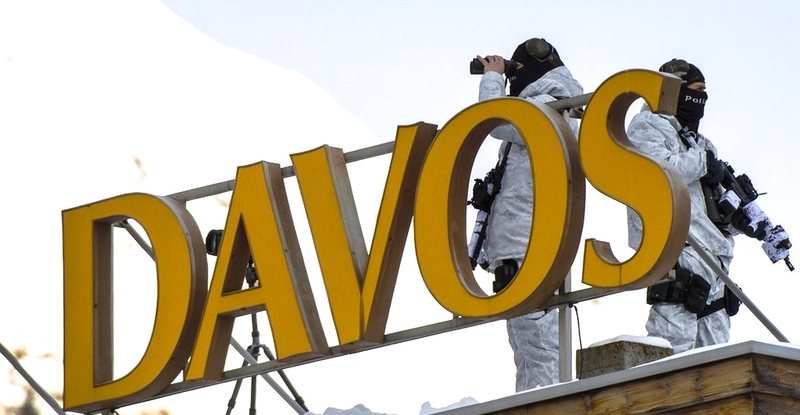 Depending on its finances from these sources, as well as being governed by individuals from these and others institutions, it is no surprise that Davos promotes the interests of financial and corporate power above all else. This is further evident on matters related to trade. In fact, at the previous Davos meeting in January 2012, high level U.S. and EU officials met behind closed doors with the Transatlantic Business Dialogue (TABD), a major corporate grouping that promotes a U.S.-E.U. “free trade” agreement. The TABD was represented at the meeting by 21 top corporate executives, and was attended by U.S. Trade Representative Kirk, WTO Director-General Pascal Lamy, the European Commissioner for Trade, Karel De Gucht, other top technocrats, and Obama’s Deputy National Security Adviser for International Economic Affairs, Michael Froman (who is now the U.S. Trade Representative). The result of the meeting was the release of a report on a “Vision for the Future of EU-US Economic Relations,” which called “to press for urgent action on a visionary and ambitious agenda.” The meeting also recommended the establishment of a “CEO Task Force” to work directly with the “High Level Working Group” of trade ministers and technocrats to chart a way forward. The guests included President Clinton, British Prime Minister Tony Blair and Mexican President Ernesto Zedillo, along with the leaders of South Africa, Indonesia, Malaysia and Finland, among others. The head of the WTO and many of the world’s trade ministers were also set to attend, hoping to try to re-start negotiations, though protesters were also declaring their intention to disrupt the Forum’s meeting. With these worries in mind, the Swiss Army was deployed to protect the 2,000 members of the Davos Class from being confronted by protesters. 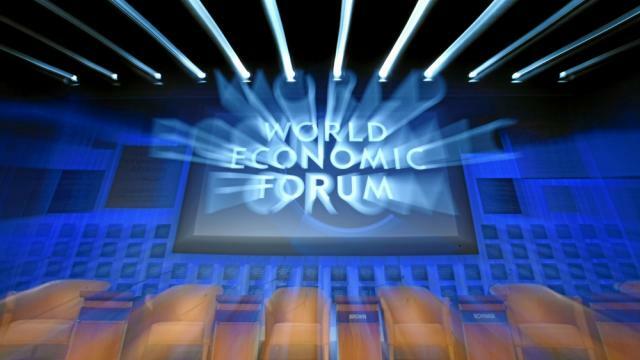 As the World Economic Forum met again in January of 2001 in Davos, “unprecedented security measures” were taken to prevent “hooligans” from disrupting the meeting. On the other side of the world, in Porto Alegre, Brazil, roughly 10,000 activists were expected to converge for the newly-formed World Social Forum, a counter-forum to Davos that represented the interests of activist groups and the Third World. As the Davos Class met quietly behind closed doors, comforted by the concrete blocks and razor wire that surrounded the small town, police on the other side of the fence beat back protesters. The January 2012 WEF meeting took place following a year of tumultuous and violent upheavals across the Arab world, large anti-austerity movements across much of Europe, notably with the Indignados in Spain, and the Occupy Wall Street movement just months prior in the United States and across much of the world. As the meeting approached, the WEF announced in a report that the top two risks facing business leaders and policy makers were “severe income disparity and chronic fiscal imbalances.” The report warned that if these issues were not addressed it could result in a “dystopian future for much of humanity.” The Occupy Movement had taken the issue of inequality directly to Davos, and there was even a small Occupy protest camp constructed at Davos. In Europe, democratically elected leaders in Italy and Greece had been removed and replaced with economists and central bankers in a technocratic coup only months earlier, largely at the behest of Germany. Mario Draghi, the head of the European Central Bank (ECB), was perhaps “the most powerful leader in Europe,” though an Occupy movement had sprung up at the headquarters of the ECB in Frankfurt as well. The 2014 meeting of the World Economic Forum drew more than 40 heads of state, including then-president of Ukraine, Viktor Yanukovich, as well as Mexico’s Enrique Pena Nieto, Japanese Prime Minister Shinzo Abe, British Prime Minister David Cameron, Brazilian Presient Dilma Rousseff, Iranian President Hassan Rouhani, Israeli Prime Minister Benjamin Netanyahu and Nigeria’s Goodluck Jonathan. U.S. Treasury Secretary Jacob Lew and prominent central bankers such as Mario Draghi and Mark Carney also attended alongside IMF Managing Director Christine Lagarde and World Bank president Jim Yong Kim. As the meeting began, a major report by the World Economic Forum was published, declaring that the “single biggest risk to the world in 2014” was the widening “gap between rich and poor.” Thus, income inequality and “social unrest are the issue[s] most likely to have a big impact on the world economy in the next decade.” The report warned that the world was witnessing the “lost generation” of youth around the world who lack jobs and opportunities, which “could easily boil over into social upheaval,” citing recent examples in Brazil and Thailand. Brazilian President Dilma Rousseff is due to attend the annual Davos meeting this week. But just prior to that meeting, violent protests erupted in the streets of Brazil in opposition to austerity measures imposed by President Rousseff, recalling “the beginnings of the mass street demonstrations that rocked Brazil in June 2013.” One wonders whether Rousseff will be attending next year’s meeting of the WEF, or whether she will still even be president. Indeed, the growth and power of the Davos Class has grown with – and spurred – the development of global unrest, protests, resistance movements and revolution. 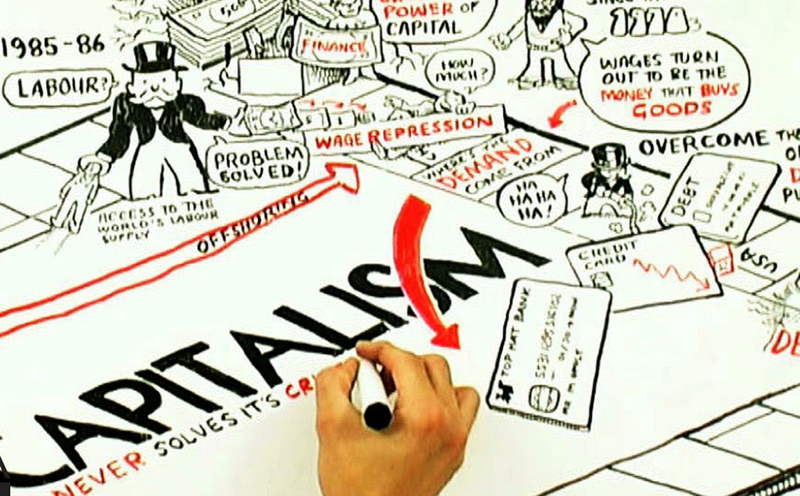 As Davos welcomes the global plutocrats to 2015, no doubt they’ll be reminded of the repercussions of the “market system” as populations around the world remind their leaders of the power of people. This is the seventh installment in a series looking at the activities and individuals behind the Bilderberg Group. Read the first part, second part, third part, fourth part, fifth part and sixth part in the series. Throughout the course of the financial and debt crises in Europe, politicians played a supporting role to financial markets and financial technocrats – that is, the economists, academics, central bankers, finance ministers and heads of international organizations who articulate the interests of powerful financial and social groups in the technocratic language of “expertise,” and who enact policies, create and shape major institutions, and whose decisions affect the lives of hundreds of millions, even billions, of people. A number of the world’s top technocrats between 2008 and 2014 have been members or guests of Bilderberg meetings. Most especially, European technocrats have been highly represented within the membership, and were among the most influential players throughout Europe’s financial and debt crises. This article examines the technocratic institution of the “Finance Ministry,” specifically as it relates to the European debt crisis and the Bilderberg Group. Finance ministers and ministries have truly immense power in the modern world. They manage the finances – money and debt – and budgets of states, and are responsible for the allocation of funding to governments, their departments, and their policies. Depending on an individual nation’s power and governance system, finance ministries can often wield influence that dwarfs other top government officials, and occasionally even presidents and prime ministers. They are pivotal determining domestic and foreign policy, and most responsible for designing and implementing financial and economic policy. The wealthier a nation, the more important its finance ministry, and the more powerful are its officials. In the United States, it’s the Treasury Department and its secretary; in the U.K. it’s the Treasury and the Chancellor of the Exchequer; in most European nations, and in Japan, it’s simply the Finance Minister. The role of finance ministers in global economic leadership has only expanded in subsequent decades. They meet, discuss and coordinate global policies alongside central bankers at the G7, G8 and G20 meetings. The also hold shares in and are represented on the boards of international organizations like the International Monetary Fund (IMF), which manages the finances and economic policies of dozens of countries around the world. 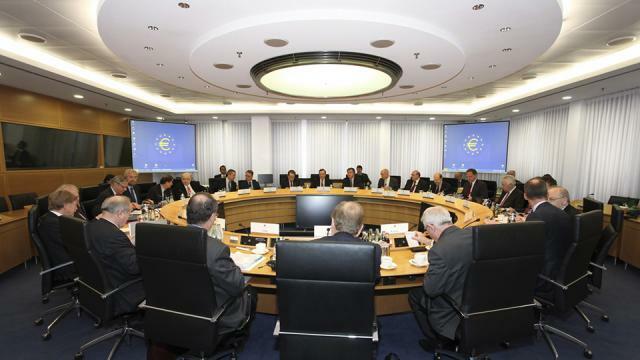 Europe’s finance ministers were pivotal in the management of the European debt crisis. These technocrats shaped the financial policies of powerful nations and international organizations, coordinated with central banks, created new transnational institutions, and pushed policies that have had profound effects upon the future of the European Union and the 500 million people who live within it. Many of the most influential finance ministers in Europe were also frequent participants in Bilderberg meetings over the period of time from the beginning of the financial crisis in 2008 and throughout the debt crisis until 2014. Throughout the course of the European debt crisis, Germany was joined by what the Financial Times called “its two closest allies in the Eurozone,” the Netherlands and Finland, who shared the German hardline demands of austerity and structural reforms for countries in crisis. Together, the central banks and finance ministries of these three nations frequently coordinated actions and objectives. The three countries were among the major creditors to the crisis-hit debtor nations, and thus their united response to the crisis guaranteed that they would be the most influential national bloc within the E.U. This gave them a great deal of leverage in shaping the policies of other major technocratic institutions, like the European Central Bank (ECB) and the European Commission (EC). In 2008, the Financial Times ranked Finland’s Jyrki Katainen as the top finance minister in Europe, describing him as “part of a new wave of youthful center-right European leaders,” and one who could possibly become the future Finnish prime minister. In 2010, Katainen was again ranked on the top ten list of the best finance ministers in Europe, as determined by a group of judges who were mainly chief economists from major banks. The Financial Times noted that Katainen, who had served as minister since 2007, led Finland “through its deepest recession since independence from Russia in 1917,” and that he was “a chief ally of Germany in the push for tougher European Union fiscal rules.” Katainen had attended Bilderberg meetings in both 2009 and 2010. In May of 2012, the Financial Times wrote that previously as finance minister and presently as prime minister, Jyrki Katainen had taken Finland on “a hard line over matters such as the Greek bailout and austerity, often exceeding the position even of Germany.” As part of this “hard line” abroad, Finland also employed it at home, with Katainen overseeing the implementation of successive austerity measures. In 2013, while Finland was entering its third recession since the financial crisis began – all under Katainen’s watch – the prime minister announced further budget cuts. She again earned a top ten spot in 2012, with the Financial Times commenting that she had “taken one of the toughest approaches on bailouts among her European counterparts,” and in doing so had “caused tension with her predecessor, Kyrki Katainen,” then serving as prime minister. In the midst of the eruption of the Greek debt crisis in 2010, the Greek Finance Minister, George Papaconstantinou, who was responsible for negotiating the E.U. bailout, attended that year’s Bilderberg meeting. That same year, the Financial Times gave him a top ten ranking, noting that he had “stayed cool while negotiating harsh fiscal and structural reforms with the European Union and [IMF],” and that he cut the budget deficit “by a national record.” This, of course, had extremely negative consequences for the population of Greece. In the midst of Italy’s exploding debt crisis in 2011, its finance minister, Giulio Tremonti, attended that year’s Bilderberg meeting having also earned himself a top ten ranking in 2009. A former Italian finance minister, Tomasso Padoa-Schioppa, had also attended Bilderberg meetings between 2008 and 2010. Throughout the European debt crisis, meetings of the Eurogroup, composed of the finance ministers of the 17-member states of the single currency, played a key role doing “the heavy lifting on the bloc’s economic policy, from banking reforms to bailouts.” The “Troika” that was formed to manage the debt crisis – composed of the European Central Bank, the European Commission and the International Monetary Fund – would report directly to the Eurogroup of finance ministers on all important decisions related to the bailouts and austerity packages. Finance ministers, together with Europe’s central bankers and other technocrats leading major EU and international organizations, were key to shaping the response and policies of the financial and debt crisis. At Bilderberg meetings, all of these officials were able to gather together, alongside captains of industry and top financiers, to discuss Europe’s problems and coordinate responses. Andrew Gavin Marshall is a freelance writer and researcher based in Montreal, Canada. This is the sixth installment in a series examining the activities and individuals behind the Bilderberg Group. Read the first part, second part, third part, fourth part, and fifth part in the series. It could almost be a slogan: Bilderberg brings people together. Specifically, every year, the Bilderberg Group holds secret, “private” meetings at four star hotels around the world, bringing together nearly 150 of the world’s most influential bankers, corporate executives, dynasties, heads-of-state, foreign policy strategists, central bankers and finance ministers. It also invites the heads of international organizations, think tanks, foundations, universities, military and intelligence officials, media barons, journalists and academics. Participants at Bilderberg appreciate having a closed-door forum where they can speak openly and directly to one other – and of course, not to us. But perhaps we, the people, would also like to hear what they have to say. For the past four years, Bilderbergers have been running around the world preaching the gospel of “austerity” and “structural reform” – very important terms. If you don’t know what they mean, Bilderbergers are working their day jobs to make sure you will learn. If you’ve been to Bilderberg, chances are you’re a fan of austerity: promoting it, demanding it, implementing it and profiting from it. 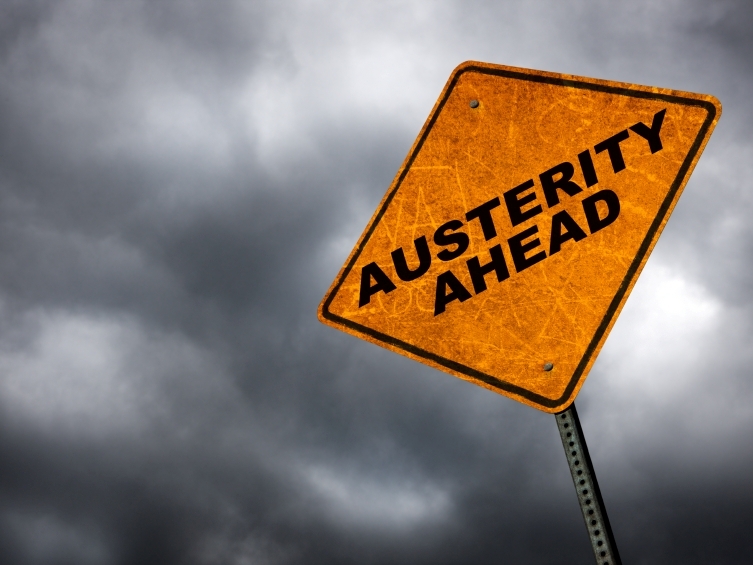 Austerity has several names and phrases, including “fiscal consolidation” and “balancing the budget.” There are so many things to call it – but in the end you know it’s austerity because the policies are the same and the effects of those policies are, too. There is a reason why political and technocratic language is made to sound so vague and dull: because behind the words lie brutal actions and devastating consequences. If we understood their true meaning, their use would very often be shocking and unacceptable. Instead, their use has become common and seemingly inconsequential. A country is in the midst of a “fiscal crisis.” It must make a very large interest payment on a debt it owes to some very large banks. These banks individually control more wealth and assets than most of the countries they deal with. Collectively, the banks hold more wealth and assets than any other single group in the world, and they always want their pound of flesh. When a country needs money, banks are there to help. Then the country is in their debt, with regular interest payments at a premium. A country can borrow an enormous sum of money by doing this, and not just from banks but from an array of financial institutions. Apart from direct loans, this money is often borrowed in a very specific way. A country is in need of financing its budget over the coming year, so it plans what is called a “bond sale.” Bonds are financial instruments (aka, numbers on screens) that represent government or corporate debt. 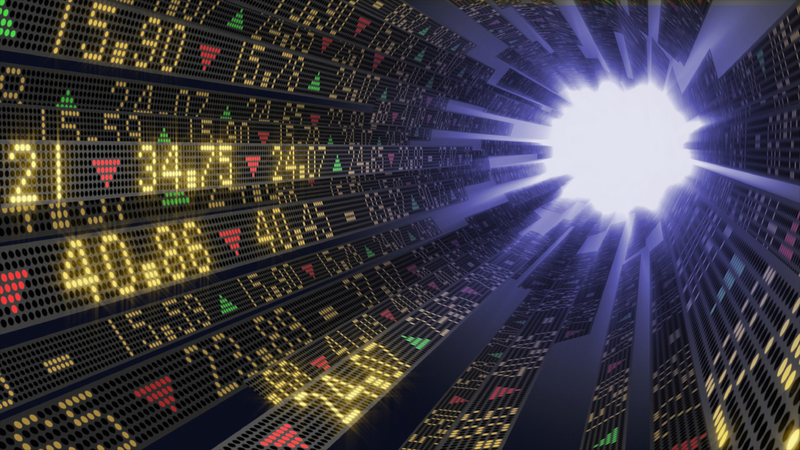 Governments sell their bonds in the “open market,” and when a government sells its bonds, the buyers are typically other nations, banks, asset management firms, sovereign wealth funds, international organizations and rich people. These parties “purchase” the bond at a set price, providing cash which that government puts in its treasury or finance ministry. In return, the newly purchased bond is a promise of future profits. It comes with a set interest rate and agreed upon dates for future payments. The government gets to fund its budget and manage its ministries and policies, while the banks earn interest – and influence. The arrangement suits both parties, so long as it keeps going forever. But of course, it doesn’t. Eventually, the country builds up a substantial overall debt. Its interest payments become much larger and more frequent. Its need to borrow becomes much greater, and in ever greater amounts. On top of managing its budget, the government now has to pay huge sums of money to the global financial cartel. If the government can’t fund its budget, provide services and pay employees, it’s a government that is likely to collapse. But if it doesn’t pay its interest to the banks, then the government will almost certainly collapse. This is because it has entered the world of global financial warfare. If a nation looks like it’s facing such a situation (which we call a “fiscal crisis”), financial markets tend to lose confidence in that country’s ability to repay its debts, and the downward spiral proceeds. They now begin to see the country as a “risk,” and suddenly institutions like credit ratings agencies are downgrading the country’s rating, just like a credit card company downgrades your individual rating. There are only three ratings agencies that dominate almost the entire global market for rating credit, so when they declare a downgrade, it becomes the gospel. This means that once a country is officially a risk, the financial institutions that continue to purchase its bonds (ie. debt) can demand a much higher interest rate on future payments, since those institutions are taking a greater risk. At this point, one of two things happens. Either financial markets continue to purchase the country’s bonds with higher interest rates, or they decide that the country is too much of a risk and they refuse to fund it further. If they continue funding, the country continues to make its payments, though it remains unable to fund its regular functions. The country is left in a perpetual fiscal crisis whereby the interest payments get larger and the crisis gets deeper. This continues until financial markets stop purchasing debt. The country is now in a major crisis. This is when rich, powerful governments and international organizations come to the “rescue” with money to lend – specifically, the United States, Germany, Britain, France, Japan, the European Union and the International Monetary Fund (IMF). But their money comes with strict conditions. These conditions have been defined and demanded beforehand by the major banks and financial institutions, and by the plethora of economists, central banks and finance ministries that support them. These are the “experts” and technocrats of global economic governance. Such conditions require a country to “fix the problem” that created its fiscal crisis. But the main problem facing countries, according to bankers, economists, technocrats and politicians, is that they spend far too much money on social services that benefit their populations. Therefore, in order for a country to be able to borrow, it must implement “correct” policies designed to balance its budget and restore public finances. These policies are collectively described as “austerity measures,” and the process of implementing them is frequently referred to as “fiscal consolidation.” Long story short: governments must cut spending. This means that healthcare, education, pensions, welfare and social services must be drastically gutted, masses of public sector employees must be fired, and taxes must be increased. Thus, austerity creates a new class of unemployed, pushed into poverty and deprived of all the resources that are meant to help the poor and disadvantaged, let alone everyone else. The economy goes into a deep depression as people stop spending and businesses collapse, unemployment and poverty soar, suicide and mortality rates increase, and racial and ethnic conflicts erupt. All of this is done so that a country is able to get a large loan (sometimes called a national bailout) from institutions like the IMF, European Union and the central banks of powerful U.S., Japanese and European nations. This loan is provided in order to pay the interest the country owes to the global financial cartel. Populations are impoverished and societies are devastated in order to pay interest to global banks. All of this happens as a result of numbers on screens. This is “austerity,” or “fiscal consolidation,” as we know it. Either coupled with or following from austerity measures, lenders and bankers demand that the conditions of the loans include not only “necessary” austerity measures, but also important “structural reforms.” This bland term hides policies and objectives behind it that have the effect of radically altering the entire structure of the economy over a period of several years or even decades. These “reforms” will make the economy strong and “competitive” again, and bring the country out of its austerity-induced depression. Typical structural reforms include privatizing all state-owned companies, assets and resources, which allow foreign companies, states and banks to purchase important national assets cheaply (and provide a short cash infusion in the process). Countries then have to further “liberalize” markets by reducing any and all government protections and regulations over specific sectors of the economy, allowing foreign banks and corporations to “compete” on an “even playing field.” This forces local and national industries, businesses and communities to compete against some of the largest transnational corporations in the world, many with more wealth and assets than their entire country is worth. As a result, foreign investors can afford to out-compete the local economy by providing cheaper products and services while maintaining global profits. Local businesses cannot compete, so they fail or are bought up. This often contributes to growing unemployment. One of the key “structural reforms” demanded is “labor flexibility.” In countries with unions, workers rights, pensions and protections, where the labor force has institutional power, the labor market is often considered “rigid.” It does not bend to the wishes and demands of corporations and financial markets that want labor to be “flexible” to their demands. What do they demand? Cheap, exploitable labor. Implementing “labor flexibility” means it’s necessary to dismantle labor protections, regulations and benefits. Essentially, it’s a war on the working class. “Structural reforms,” in essence, open up a nation, its resources and its population to be controlled, exploited and plundered by the world’s largest banks and corporations. These would be hard policies to sell if those who sold them spoke plainly. Instead, they describe a world in which nations need to “increase competitiveness” and implement the necessary “structural reforms” to create “economic growth.” The point is that it’s all so technical, you’re not supposed to understand it. But actually, it’s pretty simple. Which is why, every day, more and more of us are getting the message. Andrew Gavin Marshall is a freelance researcher and writer based in Montreal, Canada. In Part 1 of this series, I examined the history and early evolution of the annual meeting that takes place among world bankers and financial and monetary officials at the International Monetary Conference. Part 2 looked at the role of the IMC in the lead-up to the 1980s debt crisis.Part 3 examined the influence of the IMC throughout that decade’s debt crisis. This last installment – published just as the IMC prepares for its June 1-3 meeting at Hotel Bayerischer Hof in Munich, Germany – looks at what the IMC has done since the 1990s to maintain its status among the world’s most highly influential bodies in economic, financial and monetary affairs. Included is a rundown of bankers who run the IMC along with leaked documents from the 2013 meeting in Shanghai. Throughout the 1990s, the IMC continued to be a significant forum for discussion among bankers and finance officials. Remarks made by Federal Reserve chairman Alan Greenspan and Hans Tietmeyer, the president of Germany’s Bundesbank (the Central Bank of Germany), at the 1995 meeting of the IMC led to a strengthening of the U.S. dollar and a weakening of the German mark in international currency markets. 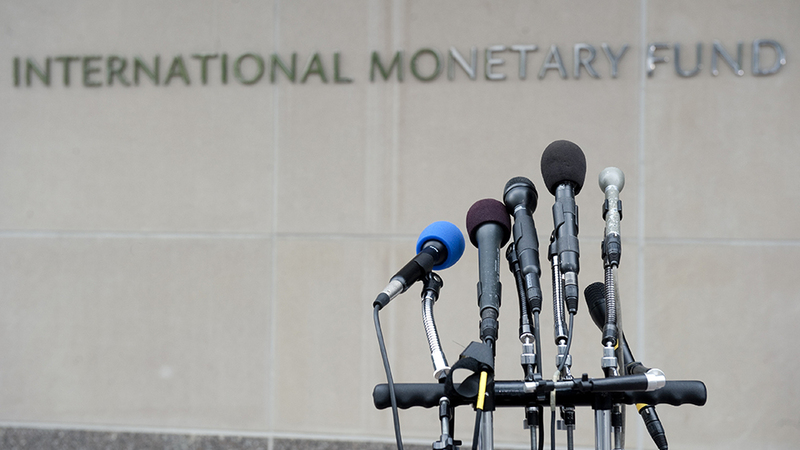 In the early 21st century, the International Monetary Conference has remained relevant, as admitted during a 2001 press conference with the president of the European Central Bank, Willem F. Duisenberg. Duisenberg had been criticized by European media for not attending a recent Eurogroup meeting of finance ministers and central bankers from euro-currency countries, which had gathered in Brussels. “I would like to point out that it has been a tradition since 1954 that the highlight of the annual International Monetary Conference, which is held in a different place every year, is the so-called Central Bankers’ Panel in which the central banks, or central bankers, of the three main currencies in the world participate. And I did so. It would have drawn more attention had I not been there, than had I been in Brussels… I can tell you that the next meeting of the International Monetary Conference will be … in Montreal [in 2002], and the year after it will be … in Berlin. On both occasions you can be sure, if it happens to coincide with the meeting of the Eurogroup, that the ECB will be represented in the Eurogroup by the Vice-President. Indeed, as recently as the IMC’s 2013 meeting in Shanghai, we can see that the importance and relevance of the annual meeting has not diminished. Though the IMC has no publicly-accessible website, I managed to compile a rough list of leading officials and board members of the International Monetary Conference, drawing information from references on their official CVs and publicly-available biographies, as well as from leaked documents including a program overview of the 2013 conference. The president and chairman of the International Monetary Conference is Baudouin Prot. Formerly CEO of BNP Paribas, one of France’s largest global banks, Prot is currently chairman of that bank as well as a current board member of Kering, Veolia Environment, Lafarge, Erbé SA and Pargesa Holding SA. He is a member of the International Advisory panel to the Monetary Authority of Singapore, the International Business Leaders’ Advisory Council to the Major of Shanghai, the European Financial Services Round Table, and is chairman of the European Banking Group. The executive vice president of the IMC is Frank Keating, President and CEO of the American Bankers Association and former president and CEO of the American Council of Life Insurers (2003-2011). Keating is also the former governor of Oklahoma (1995-2003), a former official in the U.S. Department of Housing and Urban Development, and a former Assistant Secretary of the Treasury. Additionally he is a member of the board of directors of the National Archives Foundation, the Bipartisan Policy Center, the Jamestown Foundation, and he was a member of the Bipartisan Policy Center’s Debt Reduction Task Force in 2010. Confirmed board members of the International Monetary Conference include: Gordon Nixon, President and CEO of Royal Bank of Canada; William Downe, CEO of BMO Financial Group; Axel Weber, Chairman of UBS; Francisco Gonzalez, Chairman and CEO of BBVA; Robert E. Setubal, President and CEO of Itau Unibanco Banco SA; Richard Waugh, President and CEO of Scotiabank; Chanda Kochhar, Managing Director and CEO of ICICI Bank; Jacko Maree, senior banker at Standard Chartered; Andreas Triechl, Chairman and CEO of Erste Group Bank; and Walter B. Kielholz, the Chairman of Swiss Re. Interestingly, there are no major American banks or bankers listed as current board members of the IMC, which is dominated by European and Canadian bankers. Further, there were three bankers whose CVs listed them as “members” of the IMC, but when I attempted to contact the IMC and the American Bankers Association to confirm whether they were board members – the IMC has roughly 15 board members, and I had only confirmed 12 of them – neither the ABA nor IMC replied to my multiple inquiries. The three bankers who were listed as “members” – and possible, though unconfirmed, board members – are Federico Ghizzoni, the CEO of UniCredit; Douglas Flint, the Chairman of HSBC (also chairman of the Institute of International Finance), and Ibrahim S. Dabdoub, the CEO of the National Bank of Kuwait. Four members of the IMC board are also members of the Institute of International Finance, the leading global banking lobby group; four IMC board members are also members of the International Business Council of the World Economic Forum and the European Financial Services Round Table (EFR), a group of leading European bankers. And three IMC board members are also represented in the European Banking Group, created to advise the European Union on financial market “regulations,” as well as the Canadian Council of Chief Executives (CCCE), the leading corporate interest group in Canada. 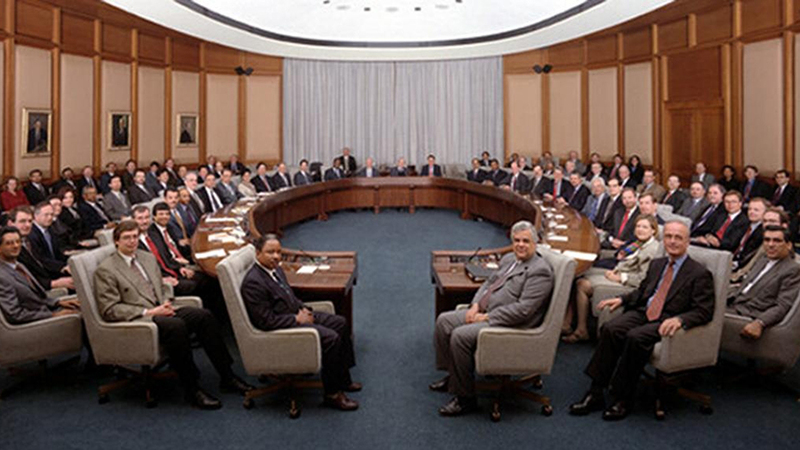 Other organizations sharing leadership with two members of the IMC board are the International Advisory Panel of the Monetary Authority of Singapore, the International Business Leaders’ Advisory Council to the Major of Shanghai, and the International Advisory Committee of the Federal Reserve Bank of New York. If we include the three bankers whose CVs listed them as “members” of the IMC, the cross-over representation of leadership in these institutions increases: the European Financial Services Round Table increases representation from four to six members of the IMC board, the European Banking Group from three to five members, the Institute of International Finance from four to five, and the International Business Leaders’ Advisory Council to the Mayor of Shanghai increases from two to three. Leaked documents from the 2013 IMC meeting in Shanghai show the planned program for the four-day conference held at the Four Seasons Hotel Shanghai in early June of 2013. Welcoming remarks were presented by the President and CEO of the American Bankers Association, Frank Keating, followed by opening remarks from the BNP Paribas chairman and president of the IMC, Baudouin Prot. On Monday, June 3, speakers at the IMC included Han Zheng, a member of the Political Bureau of the CPC (Communist Party of China) Central Committee; Mario Draghi, President of the European Central Bank; Douglas Flint, Chairman of HSBC and Chairman of the Institute of International Finance (unconfirmed board member of the IMC); Jaime Caruana, General Manager of the Bank for International Settlements (BIS); Lord Adair Turner, former chairman of the Financial Services Authority in the UK and a Senior Fellow of the Institute for New Economic Thinking; and Janet Yellen, Vice Chair and Governor (now current Chair) of the Federal Reserve Board. Other speakers at the 2013 International Monetary Conference included Axel A. Weber, Chairman of UBS; Niall Ferguson, the Lawrence A. Tisch Professor of History at Harvard University; Jacob A. Frenkel, Chairman of JPMorgan Chase International and Chairman of the Board of Trustees of the Group of Thirty (G30); Tharman Shanmugaratnam, Deputy Prime Minister and Minister for Finance in the Government of Singapore; Zhou Xiaochuan, Governor of the People’s Bank of China (China’s Central Bank); Jamie Dimon, Chairman and CEO of JPMorgan Chase; Jurgen Fitschen, co-Chairman of Deutsche Bank; John G. Strumpf, Chairman, President and CEO of Wells Fargo; Francisco Gonzalez, Chairman and CEO of BBVA; Sir Martin Sorrell, CEO of WPP; and Victor Yuan, Chairman and President of Horizon Research Consultancy Group. Additional speakers at the conference included Jiang Jianqing, Chairman of the Industrial and Commercial Bank of China (ICBC); Stephen Bird, CEO for Asia Pacific at Citibank in Hong Kong; Michael Pettis, Professor of International Finance at the Guanghua School of Management at Peking University in Beijing; Peter Sands, Chief Executive of Standard Chartered; Shang Fulin, Chairman of the China Banking Regulatory Commission; Tian Guoli, Chairman of the Bank of China; and Andrew Sheng, President of the Fung Global Institute in Hong Kong. Indeed, systemic problems of the global monetary, financial and economic system will likely remain unresolved so long as forums like the International Monetary Conference are permitted to take place outside public scrutiny. Such meetings, where central bankers, regulators and leading financial policy makers meet in private with the world’s most influential bankers, only encourage consensus, closer cooperation and, ultimately, collusion between our so-called public officials and the bankers who profited off the financial and economic destruction which they themselves caused. Andrew Gavin Marshall is a researcher and writer based in Montreal, Canada. He is project manager of The People’s Book Project, chair of the geopolitics division of The Hampton Institute, research director for Occupy.com’s Global Power Project and the World of Resistance (WoR) Report, and hosts a weekly podcast show with BoilingFrogsPost. In the first part of this Global Power Project series, I examined the origins and early evolution of the International Monetary Conference, an annual meeting (to be held June 1-3 in Munich) of several hundred of the world’s most influential bankers who gather in secrecy with the finance ministers, regulators and central bankers of the world’s most powerful nations. The second part looked at the role of the IMC in the lead-up to the 1980s debt crisis. Now, in Part 3, we examine the role the IMC played throughout that debt crisis which began in August of 1982. At the 1982 International Monetary Conference, bankers noted that they had been cutting back extensively on loans to developing countries, with some leading bankers warning that the lending cut-backs could result in “aggravating the problems of countries already in economic difficulties and threatening to throw them into default” – which is exactly what happened a couple of months after that’s year’s conference. In the first full year of the international debt crisis that tore Latin America and other developing countries into financial ruin – with entire populations pushed overnight into poverty through austerity measures that were demanded by the IMF and the global banks, in return for additional loans and debt rescheduling – the more than 200 global bankers at the International Monetary Conference met in Belgium where they were “treated like royalty,” met at the airport by “special hostesses” and were then chauffeured in Mercedes limousines to the Hyatt Regency Hotel. The bankers at the 1983 conference agreed that the major debtor countries, in particular Brazil and Mexico, would need time to reshape their economies, with estimates ranging from three to seven or eight years of austerity, and various “structural reforms” designed to enforce neoliberal economic policies upon those entire populations. James Wolfensohn, a former partner at Salomon Brothers who started his own consultancy (and later went on to become President of the World Bank), delivered a popular speech at the IMC recommending that there could be no one solution to the debt crisis, but that each country would have to be handled on a case-by-case basis. The banker William S. Ogden, a former vice chairman of Chase Manhattan, presented another popular speech at the IMC in which he explained that what was needed to resolve the debt crisis was “sustained world economic growth, avoidance of protectionism, increased government aid to the third world and more disciplined economic policies among the developing countries.” In other words, harsh austerity measures. That very same year, Ogden was in the midst of creating a unique organization of international banks and bankers to represent their collective interests as a global community in the face of the debt crisis. That organization came to be known as the Institute of International Finance, itself the subject of a previous set of exposés in the Global Power Project. At the 1984 meeting of the International Monetary Conference (IMC), a special meeting occurred among some of the top banks that held a large percentage of Mexico’s debt. They participated in a “closed meeting” with major central bankers and finance officials, including representatives of the IMF, who recommended that the banks lower their interest rates on loans to Mexico in order to reduce pressure on the country. Walter B. Wriston, chairman of Citicorp, who had previously opposed any concessions to the impoverished nations in crisis, at this point appeared willing to adhere to some reductions in interest rates for Mexico. The closed meeting was also attended by Willard C. Butcher, Jr., the chairman of Chase Manhattan; John F. McGillicuddy, chairman of Manufacturers Hanover Trust Company; Lewis T. Preston, chairman of J.P. Morgan & Company; Walter V. Shipley, chairman of Chemical Bank; Wilfried Guth, managing director of Deutsche Bank; Guido R. Hanselmann, executive board member of Union Bank of Switzerland (UBS), and Sir Jeremy Morse, chairman of Lloyds Bank of London. The following day, the international banks announced that they would agree to negotiate a long-term debt solution for Mexico. Included in the decision as well was the IMF managing director, Jacques de Larosiere; the chairman of the Federal Reserve, Paul Volcker; and a special representative of the banks, Citibank Vice Chairman William R. Rhodes, who announced the decision to negotiate on behalf of the banks and who was personally responsible for chairing multiple “bank advisory committees” that negotiated debt rescheduling with various countries in Latin America. At the next year’s meeting of the IMC, then-Chairman of the Federal Reserve, Alan Greenspan, spoke to the assembled bankers, explaining that further declines in the U.S. Dollar would not help American exports. His comments led to a rise in the Dollar, “greeted positively in the financial markets,” and stock and bond prices rose on Wall Street. The heads of the central banks of other major industrial nations, such as West Germany and Britain, were also present at the conference where collectively the central bankers “reiterated the need to keep inflation down as a way to continue worldwide economic growth” – a position met with great approval by the bankers present at the meeting. At the 1989 meeting of the IMC, many of Mexico’s largest international lenders attended a special meeting after which they announced a $5.5 billion “aid” package (aka bailout) for Mexico in cooperation between Japanese banks, the IMF and the World Bank. But the so-called “aid packages” handed out by Western banks and international organizations to the crisis-hit developing nations were, in fact, bailouts for the major banks: the funds were given to the countries explicitly to pay the interest that they owed to the banks, while at the same time forcing those governments to implement strict austerity measures and other economic reforms. William R. Rhodes, Citibank’s main official responsible for debt rescheduling agreements, was present at the meeting, which was also attended by Angel Gurria, the chief debt negotiator for Mexico. Rhodes stated that the meeting at the IMC “set the stage for rapid progress.” In the final part of the Global Power Project series on the International Monetary Conference, I examine the continued relevance of the IMC from 1989 to the present – including the bankers who composed its leadership, as well as a review of leaked documents pertaining to the 2013 meeting of the IMC in Shanghai. Andrew Gavin Marshall is a 27-year-old researcher and writer based in Montreal, Canada. He is project manager of The People’s Book Project, chair of the geopolitics division of The Hampton Institute, research director for Occupy.com’s Global Power Project and the World of Resistance (WoR) Report, and hosts a weekly podcast show with BoilingFrogsPost.